Rye Toast with Bacon, Avocado and Tomato – 295kcals and 14.7g of fat per serving. Toast the rye bread and grill or griddle the bacon. 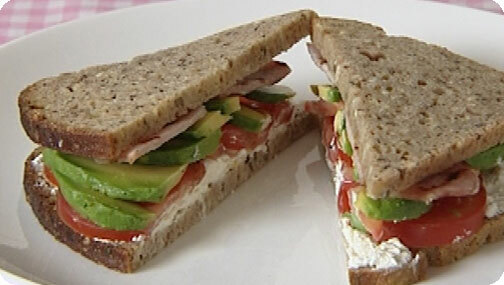 Spread with cream cheese arrange the bacon, avocado and tomato over the top of one then sandwich with the other.